Quincy, IL’s one and only women’s flat-track roller derby team is starting our 6th season with a bang on May 7th as we take on organized crime against The Chicago Outfit’s Shade Brigade. The off season has been filled with fun and intense training, and we are so excited to once again show our community the pride we have in it as well as the strength we have as a team. We will be bouting on behalf of Quincy Teen Reach, AND our fantastic venue, Scottie’s Fun Spot, will be hosting an adult skate night after the bout as an after party! Anyone who purchases entry to the bout can stay for the adult night without paying an additional admittance fee. Please join us on May 7th at Scottie’s Fun Spot (8000 Broadway, Quincy) to kick off what promises to be an exciting season of roller derby action. Tickets can be purchased in advance at Scottie’s or from a DRDC member for $8, and they are $10 at the gate. Kids 12 and under are free! Doors open at 6:30pm, and the first whistle blows at 7:00pm. Check out DRDC’s new commercial for the 2016 season, courtesy of Table 16 Productions! 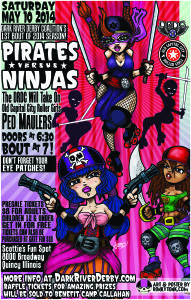 DRDC will be heading to Coralville, IA this Friday to take on the women of OCCRD. We will be lead by our fearless Coach Bloyd, Captain LaFostina and Co-captain Ram Skillet. OCCRD may out rank us by almost 100 but it is bound to be a battle. DRDC does not have the word quit in their vocabulary. If you’re in the area head out to the Marriott. Doors open at 7pm. You know you want to. Come out to Scottie’s of September 26th to see the last home bout of the season. DRDC will be taking on the Quad City Rollers. Make sure to come early as this will be a double header. The Quad City Rollers junior league will be going up against team Kentucky. This will begin at approximately 5:30pm. Come root on these boys and girls, who are the future of roller derby. Then stick around and root on your home team. We are looking for our 11th straight win. Can’t wait to see you all out there. Make sure you head out to Scotties this Saturday Aug. 29th. 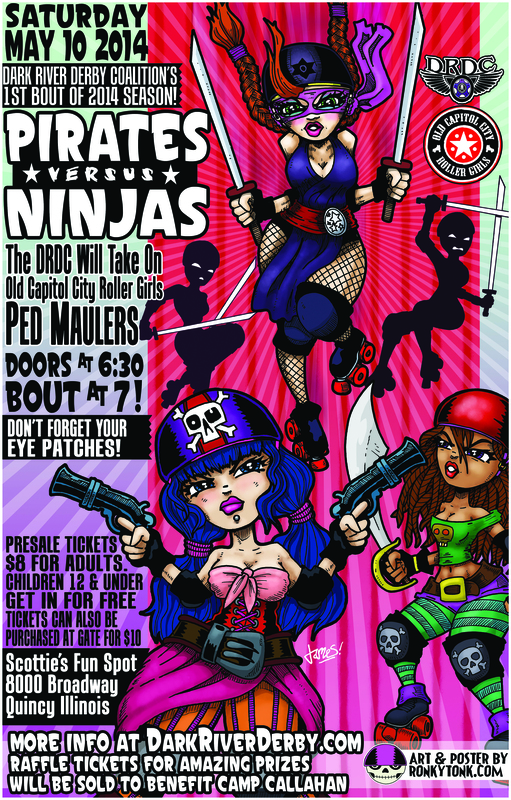 DRDC will be hosting the Cedar Rapids Roller Girls. We will ready to hit the new floor and remain undefeated. Doors open at 6:30pm and the game starts at 7. It’s bound to be a hard fought bout. Get tickets from your favorite skater for $8. or $10 at the door. Children 12 and under are free. A portion of the proceeds goes to St. Jude Children’s Research. Hope to see everyone out there. There is only two more home games left. DRDC face the Prairieland Punishers on August 15th! The Dark River Derby Coalition face the Prairieland Punishers this Saturday (August 15th) at 7:15PM in Decatur, IL. This will be our 2nd WFTDA sanctioned bout. DRDC is currently 8-0 for the 2015 season. We expect this bout will be a well fought battle. If you’re looking for a road trip this weekend, head on over to Decatur to root on your Dark River Derby Coalition! DRDC will be hosting the River Demon Roller Girls on April 25th 2015 at Scotties. The theme of the night is “Purple is the New Black”. A portion of the proceeds will be benefitting Quanada. We are asking everyone to wear purple on this night to support your DRDC. The Dark River Derby Coalition will take on Midstate Mayhem in an all out time war! Raffle tickets for AMAZING prizes will be sold to benefit The Quincy Neighborhood Federation. Home bouts are played at Scotties Fun Spot 8000 Broadway Quincy, IL 62305 Doors open at 6:30pm, Bout starts at 7pm.